Posted on 12/23/2009, 9:25 am, by rackycoo, under Rock Paper Scissors. 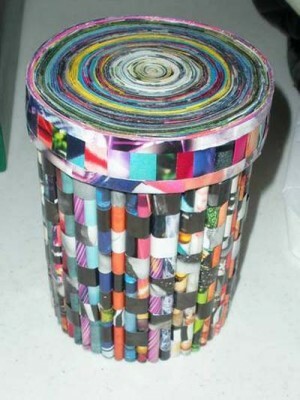 Take all those old magazines you have lying around, and put them to work! That’s what bananasandhair has done. She put a twist on the magazine bowls and made this great container with a lid. It’s colorful and fun, and you can hide all kinds of things in there. Thanks for sharing, bananasandhair!